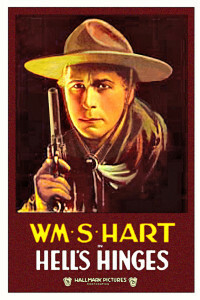 From at least the 1910s, a common theme in western movies has been the outlaw or gunman whose life is turned around by religion and the love of a good woman (see William S. Hart in Hell’s Hinges, 1916, for example). In the age of populist directors like Frank Capra and John Ford (the 1930s and 1940s), religion—specifically Protestant Christianity, but also Catholicism—was seen as a constructive and regular part of the American consensus. A religious community was usually a civilizing influence, often with a significant dose of sentimentality. 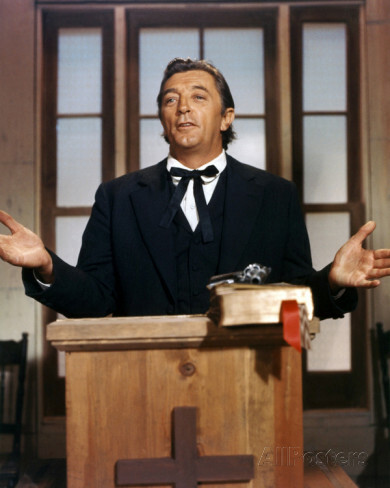 Sometimes that religion and its role in American life was central to the story of a western, as in 3 Godfathers, Angel and the Badman and Stars in My Crown (all very good movies). When Gregory Peck found that his quest for revenge had been misdirected in The Bravados, he sought and found solace by talking with a priest. Moving into the 1960s, there was increasing disillusionment with many American institutions, such as the military, government and big business, and some of that rubbed off on churches as well. Religion seemed less comfortable and less a significant part of regular life, and religious figures started to be more often fanatical than helpful or genuinely good. Priests were more frequently depicted as ineffectual, fallen or corrupt. By the revisionist 1970s, religion as a constructive force had disappeared almost entirely from westerns. That trend in part makes the 1999 made-for-television Purgatory kind of a remarkable throwback in its use of religious themes. Specific religious groups can play interesting roles in westerns. 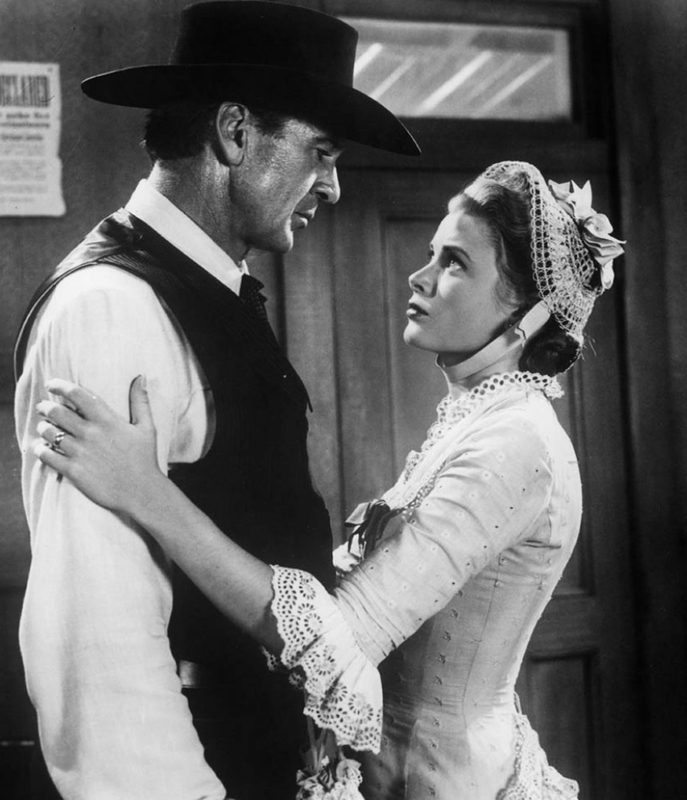 An obvious example is Quaker pacifism pitted against conventional western violence and guns, as in Angel and the Badman, High Noon and Friendly Persuasion. Mormons were a part of the history of the west, both in their migration westward and in the Salt Lake City-based empire they built in Utah and surrounding states. Fictional Mormons in the west had been prominent as villains in A. Conan Doyle’s first Sherlock Holmes story A Study in Scarlet (published in 1887), and in Zane Grey’s first best-seller Riders of the Purple Sage (1912). Beginning in the 1920s, Mormons were more likely to be seen as genuinely religious people and more part of the mainstream of history. In California and the southwest, as well as in Mexico, the Catholic church and missions played a significant role historically and in many movies (see Colorado Territory and Strange Lady in Town, for example, not to mention such arguable non-westerns as Black Robe and The Mission). Sometimes, as in Cowboys & Aliens, both the Christian and the overtly non-religious otherworldly co-exist in the same film. For more outrageous directions in use of the supernatural in westerns, see our post on Supernatural Westerns. 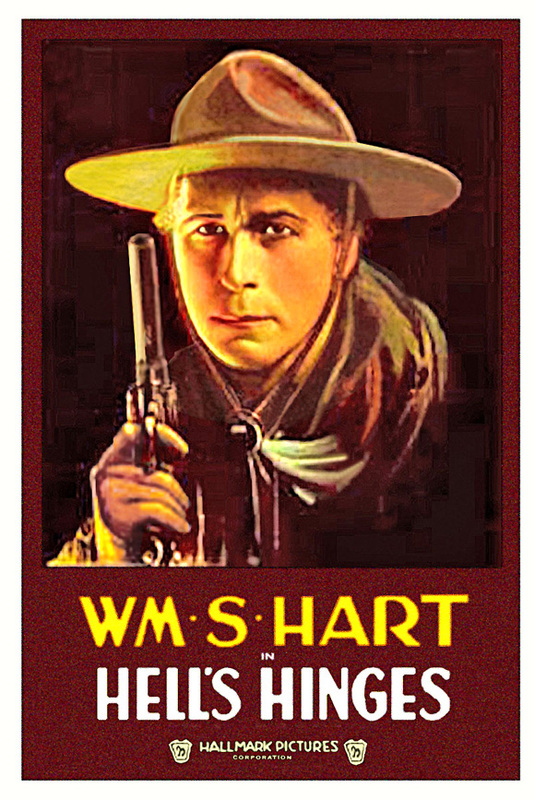 Hell’s Hinges (1916): When the corrupt town of Hell’s Hinges kills the new reverend, gunman Blaze Tracy (William S. Hart), under the influence of the reverend’s sister Faith, reforms the town with his guns. The Outcasts of Poker Flat (1937): This telling of Bret Harte’s story of gold rush California features Van Heflin as a preacher in a saloon. Bad Bascomb (1946): Outlaw Wallace Beery falls in with Mormons and turns over a new leaf under the influence of charming child Margaret O’Brien and her grandmother Marjorie Main. Heaven Only Knows (1947): Also released as Montana Mike, this is a religious fantasy in which an angel (Robert Cummings) comes to earth to save saloon owner Brian Donlevy. 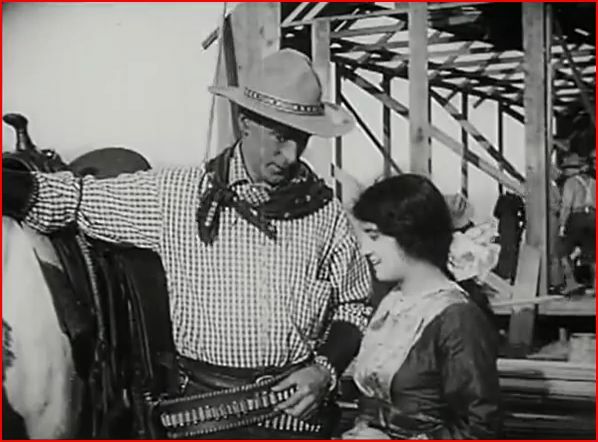 Angel and the Badman (1947): Gunman John Wayne is redeemed by his love for Quaker maiden Gail Russell. 3 Godfathers (1948): Three outlaws in the desert rescue and sacrifice for a newborn baby. The survivor (John Wayne) is redeemed by that sacrifice on Christmas Day. Four Faces West (1948): A bank robber (Joel McCrea) trying to go straight saves a Mexican family with diphtheria and is himself saved by a good nurse and a sympathetic lawman. Stars in My Crown (1950): Preacher and Civil War veteran Joel McCrea preaches in a saloon and fights disease and bigotry in Tennessee. Count Three and Pray (1955): Reformed brawler and womanizer Van Heflin returns from the Civil War and struggles to find acceptance and his way as a preacher. Strange Lady in Town (1955): The saintly local Catholic priest (Walter Hampden) maintains a clinic for the poor, at which competing local doctors volunteer, until he is unintentionally killed near the end of the movie. The Searchers (1956): Texas ranger captain and Indian fighter Ward Bond is also the local reverend. 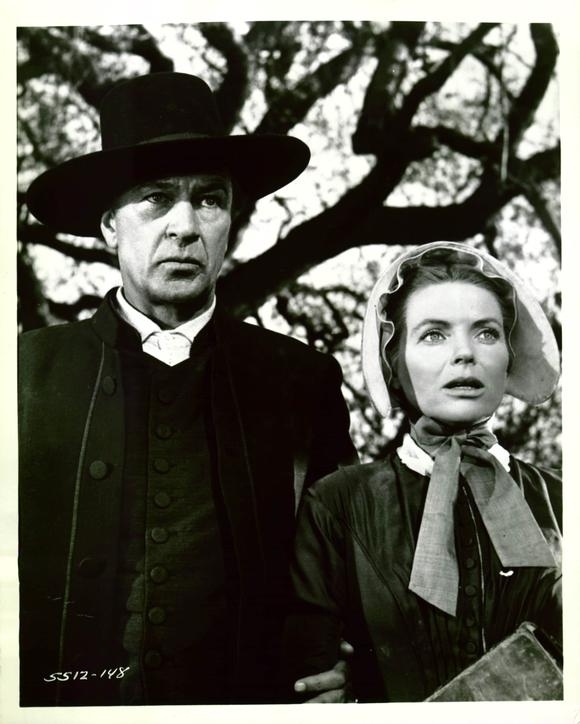 Friendly Persuasion (1956): Husband and wife Quakers (Gary Cooper and Dorothy McGuire) pit their pacifist principles against the violence around them in Civil War Indiana. 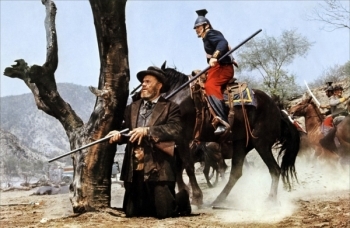 Jubal (1956): Glenn Ford’s Jubal is saved by a Quaker-like group of emigrants to whom he had been kind. The Bravados (1958): When he finds that his quest for revenge for the murder of his wife has been misdirected, Gregory Peck seeks spiritual advice from a Catholic priest and from Joan Collins. 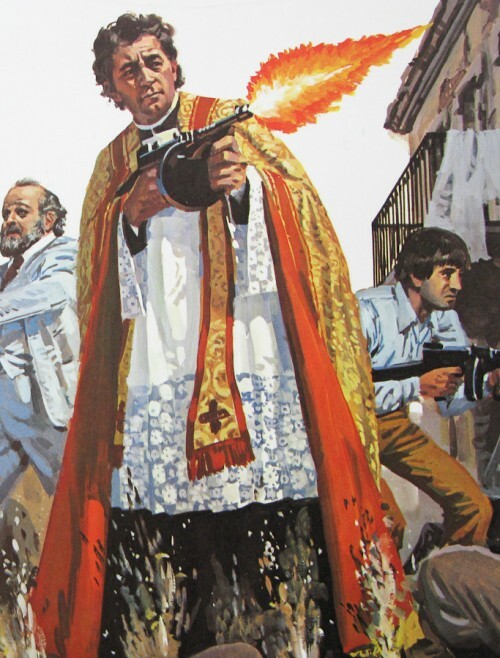 Heaven with a Gun (1969): Ex-con Jim Killian (Glenn Ford) maintains order in his church and defends the helpless with his guns. Two Mules for Sister Sara (1970): Prostitute Shirley MacLaine masquerades as a nun while working south of the border with Clint Eastwood. Pale Rider (1985): Preacher Clint Eastwood finds himself among beleaguered homesteaders battling mining interests, and reverts to his gunfighting past. Purgatory (MfTV, 1999): An outlaw gang finds itself in a curiously religious town which is reluctant to defend itself. The Outsider (MfTV, 2002): Wounded gunman Tim Daly is doctored by Quaker-ish widow Naomi Watts; this time the gunman convinces the woman to leave the religion. The Missing (2003). Traditional Christianity in the person of healer Cate Blanchett collides with the Indian animism espoused by her father Tommy Lee Jones, with ambiguous results. Cowboys & Aliens (2011). The local preacher doctors Daniel Craig’s wounded body and spirit before they both ride off to fight aliens. Forsaken (2015). Gunman John Henry Clayton (Kiefer Sutherland), long estranged from his father, Rev. John Clayton (Donald Sutherland), finally returns to his hometown in Wyoming to seek rapprochement after his mother’s death. However, the railroad is coming to town, and Brian Cox is trying to take over all the land. The now-reformed killer will have to choose his path ahead. The Magnificent Seven (2016). As Sam Chisholm (Denzel Washington) and the rest of the seven defend a California mining town under assault by the forces of a mining baron, a subtext is the role of religion in the community and the rejection of/contempt for religion by the bad guy. Robert Mitchum as the Rev. Jonathan Rudd in Five Card Stud. Note the gun on top of the bible. Gary Cooper with two Quaker wives: with Grace Kelly in High Noon, and with Dorothy McGuire in Friendly Persuasion. 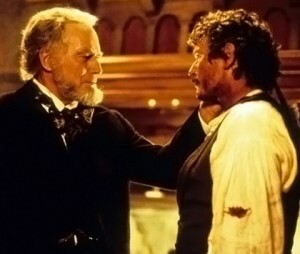 Charlton Heston as Brigham Young instructs Tom Berenger in The Avenging Angel. 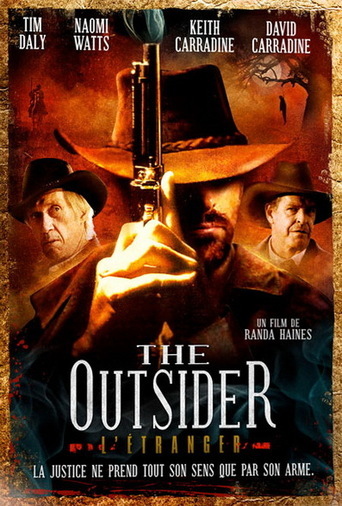 Riders of the Purple Sage: Most versions before the 1996 made-for-television film featured Mormons as the bad guys, as in Zane Grey’s 1912 novel. The 1996 re-telling is carefully non-denominational. The vengeful Rev. Dahlstrom (R.G. Armstrong) meets his end in Major Dundee. 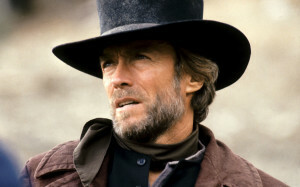 Clint Eastwood as The Preacher in Pale Rider. Robert Mitchum as Father Van Horne in The Wrath of God. The Thompson submachine gun is not a typical armament for a western. Poster art by Frank McCarthy. 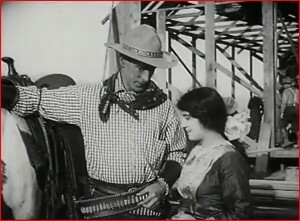 Blaze Tracy (William S. Hart) romances the Reverends’s sister Faith Henley (Clara Williams) in Hell’s Hinges. This entry was posted in Lists and tagged Westerns and Religion on November 12, 2014 by Nicholas Chennault.